For over a year I have been walking into the main floor bathroom numerous times a day, and every time I do, I shake my head. 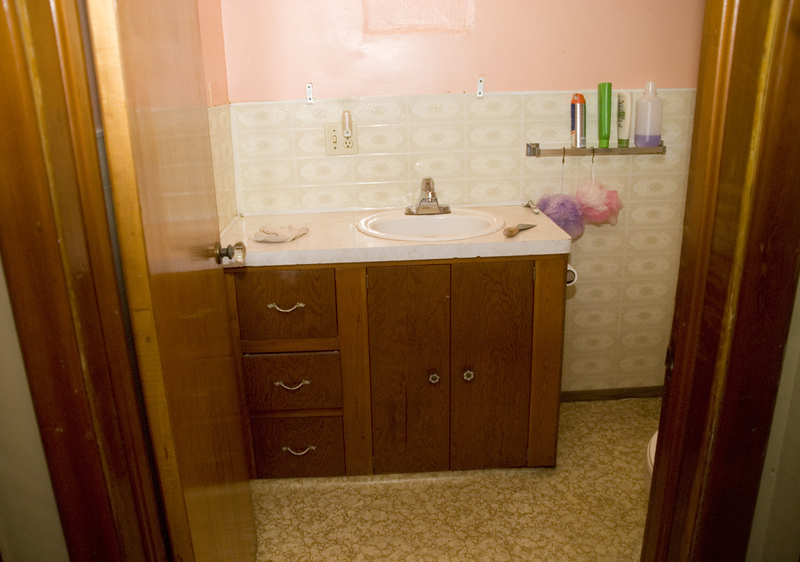 I even considered taking pictures and sending them to the “ugliest room” contest for the chance to win a free room remodel.With so many projects on the go, I did not want to spend money on this room since it was functioning and did what it was supposed to do…..it was just ugly. I mean really ugly! This is after I plastered the holes in the walls. What a beautiful pink eh? I tried putting a coat of white on the cabinet, but nothing was going to save it. It just looked outdated and, well….plywood. It just had to go. 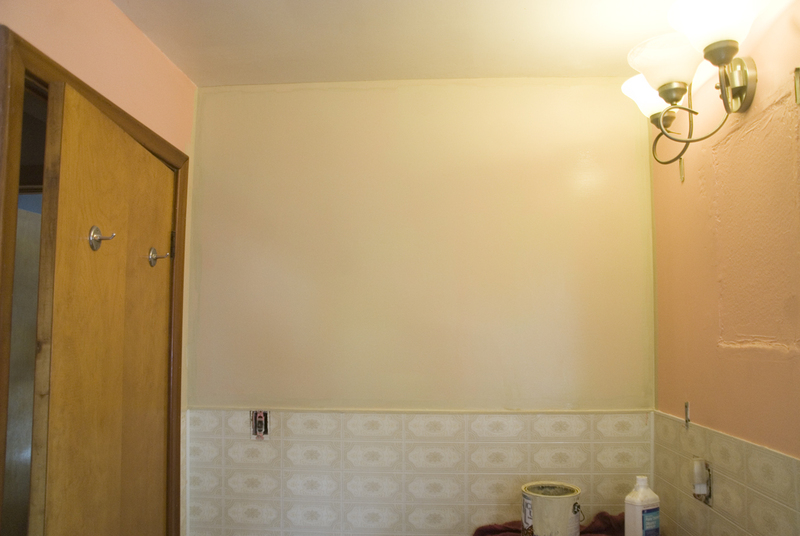 We also took the large mirror off the wall to find a giant gap where the old medicine cabinet was. That was a pleasant surprise! 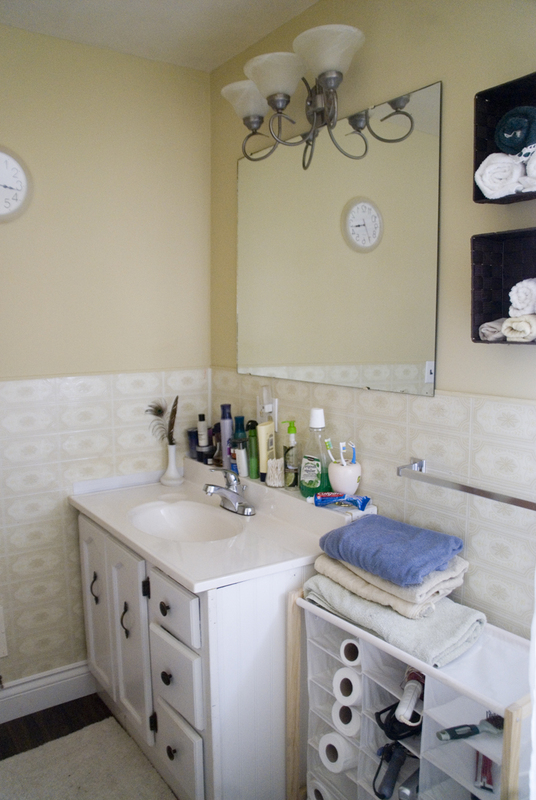 I have to tell you that this room cost under $200 and the transformation was amazing! It turned out so much better then I would have imagined! So where do I start!!! Paint! It needs paint bad! 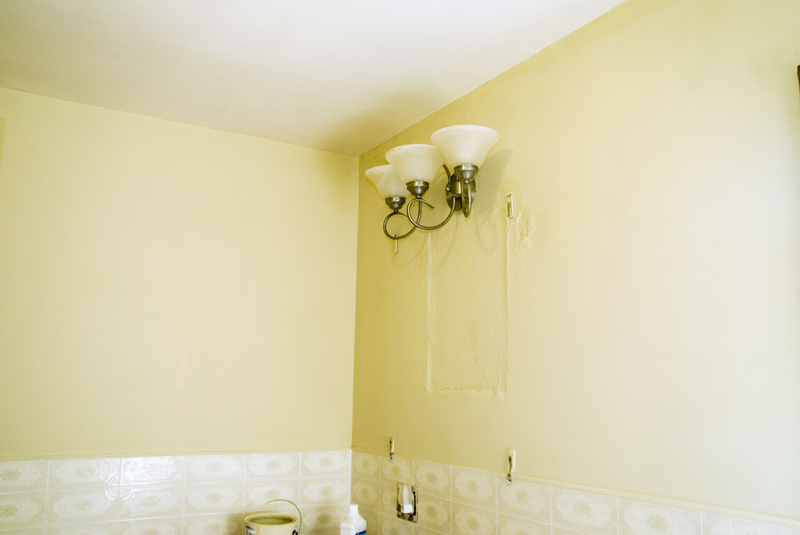 I chose a neutral light brown because it brightened up the room and matched the wall time….NOT! I chose it because it was what I had, it matched and it was free!!! I actually got lucky, it was a perfect match. Here is a good shot of the awesome hole in the wall behind the mirror. The orange trim is my nemesis in this house. One room at a time I have been ridding the orange 70’s wood and painting it white! 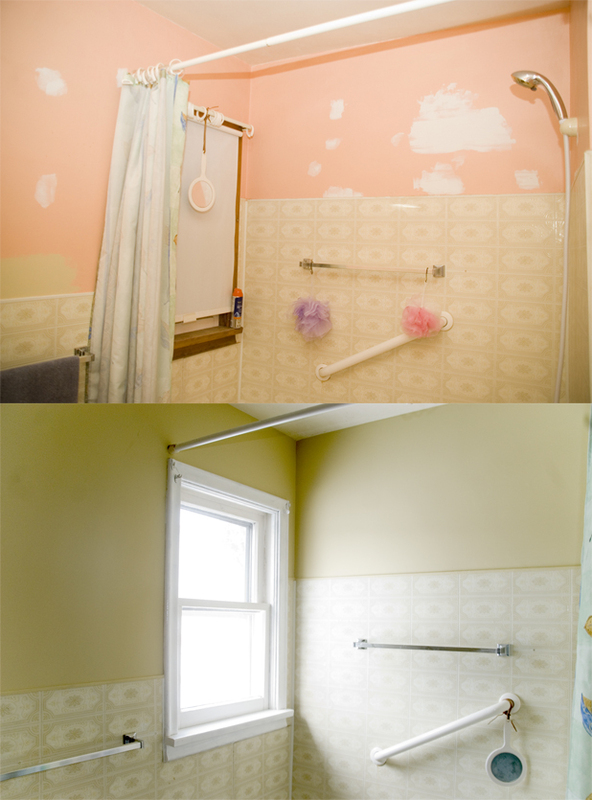 Once the window was painted, I started to see the major different in this bathroom, and still had not spent one cent! I still had that cabinet to deal with. I tried painting it, but in the end we knew we had to tear it out. 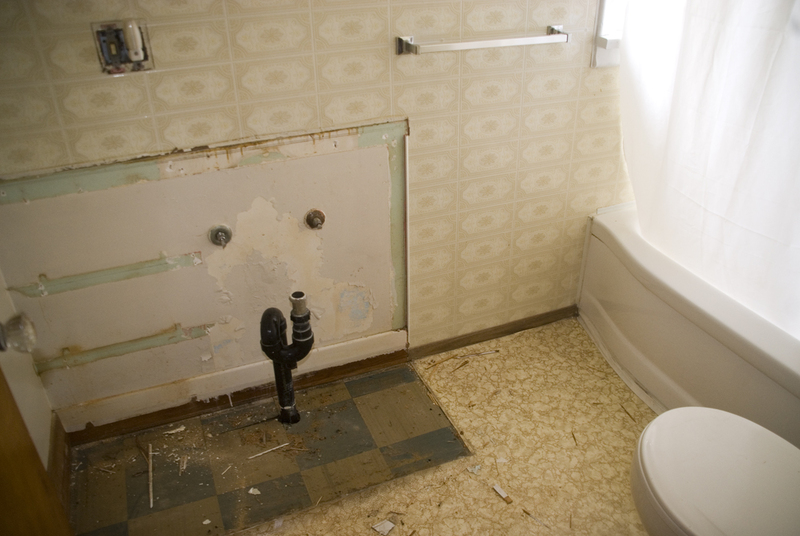 Without knowing what we were going to replace it with…..out it came! 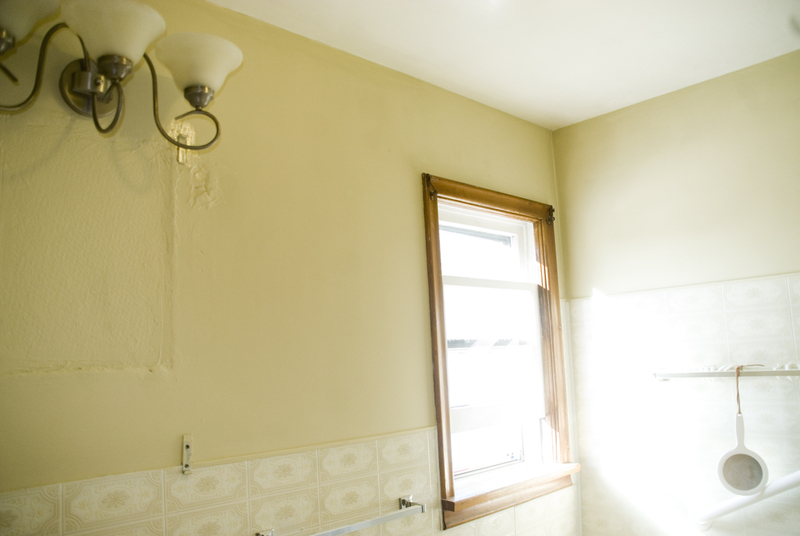 Now here is where our fast, cheap reno hit a brick wall. We took the cabinet out and realized that the wall board was put up around the cabinet…..and the cabinet was built 42″ long. OK, let me tell you, I looked everywhere for a cheap 42″ bathroom vanity and they do not exist. It would have to be custom built for a price that I was totally unwilling to pay. Hours went by discussing what we were going to do. 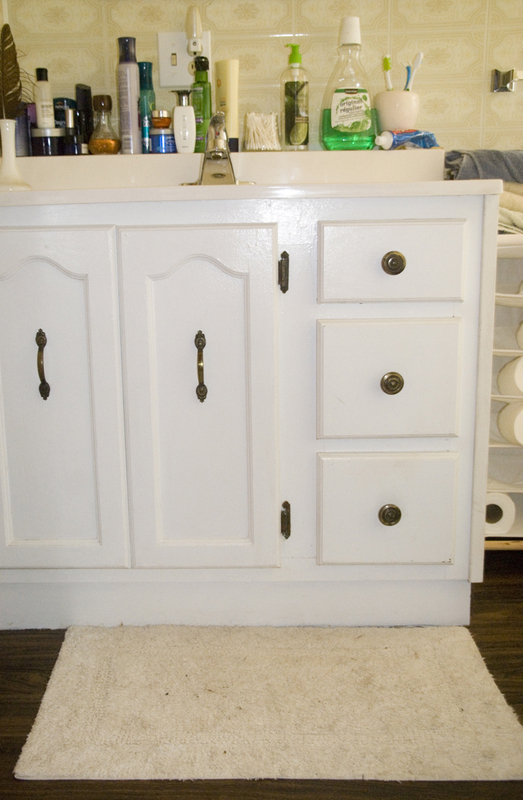 We had a vanity in storage for one of our apartment renovations, it was nice, white and 36″ long. 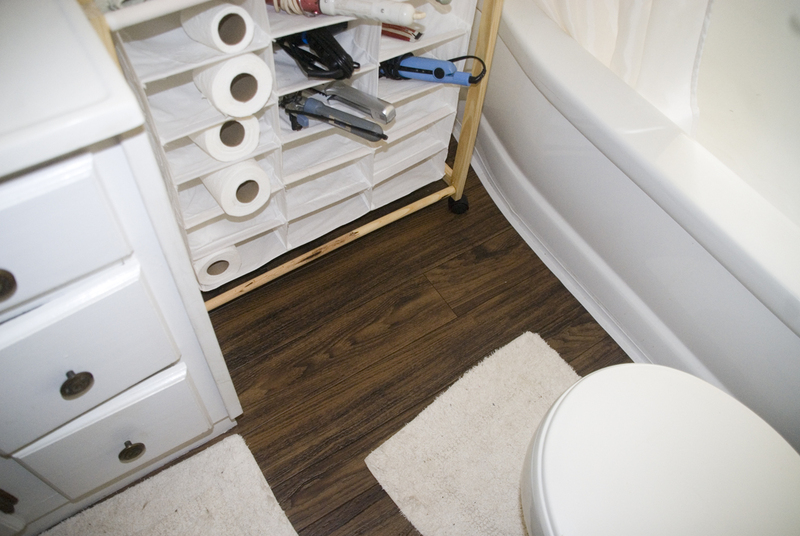 That left a 6″ gap in the tile board…..but it was free, so we had to figure it out! OK, now for the big transition. 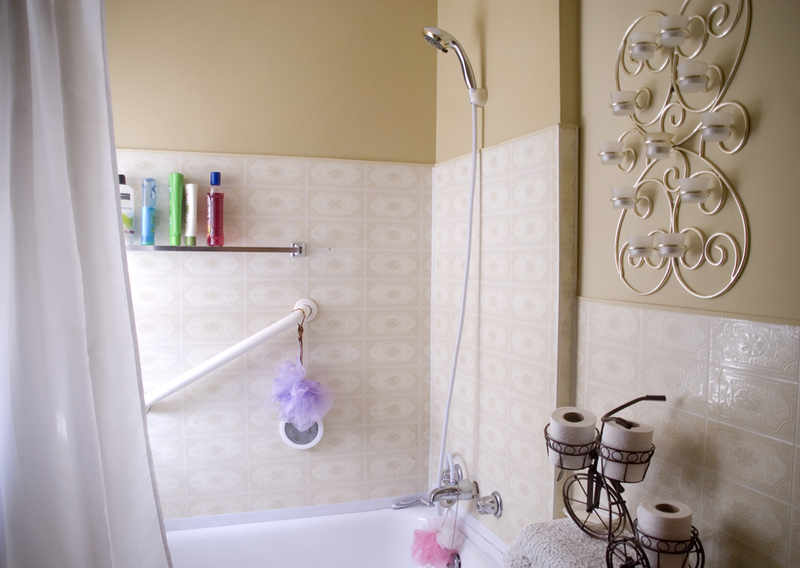 See how we hid the 6″ gap in the tile board! A shoe rack we had kicking around came in handy, and it is great storage! So bright and clean looking! 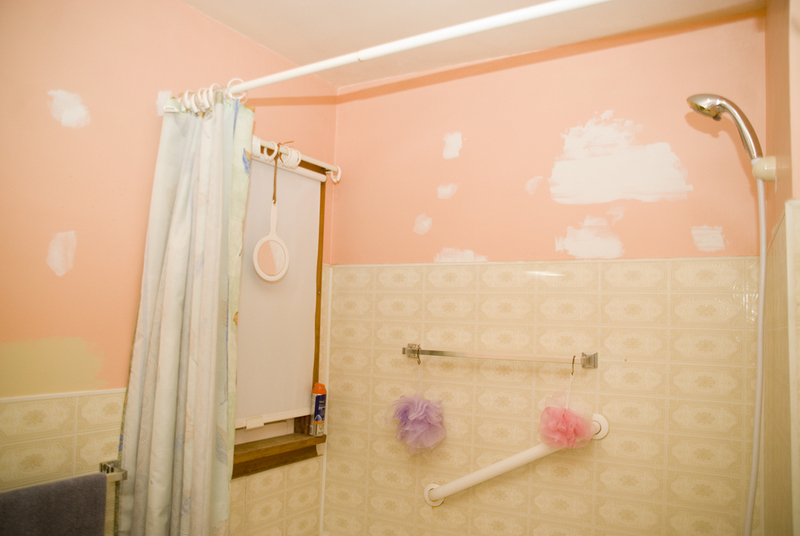 I did put a couple coats of varathane on the walls around the shower to protect it from the water. 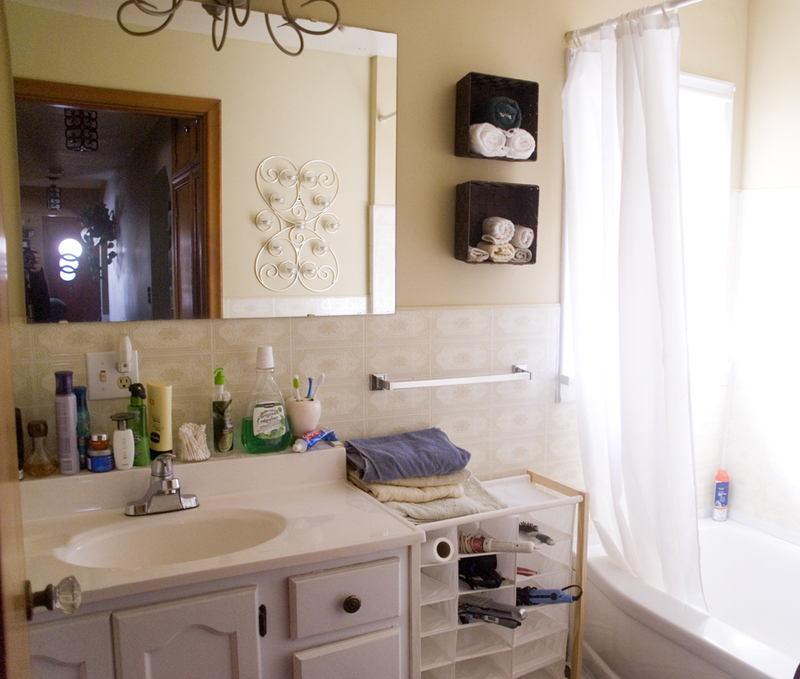 We used left over bead board to build a shelf on top of the vanity because it was a little shorter then the original. Another great storage idea! I LOVE this loose lay flooring. Looks like old barn board, but it is soft, warm and squishy! Wow, that is an amazing transformation! And at that price at that. My kind of reno!